April 17, 2019 – There is no one right way to make a delicious breaded pork tenderloin. That’s one of the reasons the Iowa Pork Producers Association (IPPA) is beginning its search of Iowa restaurants to find the best in Iowa for 2019. And, you can help! It’s the first round where you, the tenderloin-lover, will have the biggest impact. 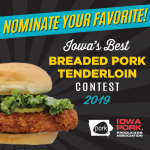 Nominations can be made online at iowapork.org/tenderloin-form, or by mailing in a form from The Iowa Pork Producer magazine to the IPPA office. Only one nomination per person, so you may have to try a few of your favorites out before sending in your selection! Also, your nomination could help you win some money. The people nominating the winning restaurant will be entered in a drawing for a $100 prize. The winning restaurant will receive $500, a plaque to display in their business and statewide publicity that will bring in new business.